Our Daily Manna 11 October 2018 – TOPIC: LET THEM SAY! Welcome to today’s devotional! There was a season in my life, when I worried A LOT about what others said or thought about me! I wanted to be in everybody’s good book and be a friend to everyone! But as I grew up and began to be announced by the LORD, I now discover that WHEN YOU ARE THE TOP, YOU WILL BECOME A TOPIC OF Discussion! Yes, the TOP MAKES YOU A TOPIC! When you become THE HEAD, YOU BECOME A HEADLINE! In fact, haters and losers will talk about you and contend with you once you become the HEAD no matter how nice you are to them! I also discovered that you must not assume that you are so important that everybody is discussing you! This is because most people you see daily are battling with one destiny attack or the other! Yes, even your enemies have their bitter battles that they are fighting! I then learnt that in life, you must learn to ignore and overlook many things if you truly want happiness, because the easiest ways to a miserable life is to think that everyone is talking about you. Some months ago, a saw a lorry with the poster: “LET THEM SAY.” Yes, LET THEM TALK! Let them say, but just keep moving! Keep your hands clean and don’t worry about what people say behind your back! It’s none of your business as long as you are true to yourself. READ Daily Manna 13 March 2019 By Bishop Chris Kwakpovwe - THE COPPER (BRASS) WITH THE POISON! Sometimes minding your own business does not keep people out of your business. Didn’t they call Jesus Christ, BEELZEBUB? You can never stop people from talking about you! Even if you commit suicide, they broadcast your death with gladness and fanfare on social media! There is a time limit for every rumour in life. Never allow freelance broadcasters to put your life on hold. Do what makes you happy. Anyone who cannot feel your pain, has no right to judge you in life. Seventy percent of those who speak negatively about you behind your back, wish to be like you. When people can’t be like you, they try to bring you down and condemn what you have. Those without money will sarcastically say that money is not everything in life. Is poverty anything? Never allow anyone to put you in a position of depression and self pity because of their opinion of you! ONLY GOD’S OPINION WILL STAND AT LAST! He is your BRAND AND IMAGE MANAGER! Those whose lives have no joy will always find every means to remove happiness from other people’s lives. If there is the GRACE of GOD in your life, then enemies are inevitable! So, determine to move on and LET THEM SAY! 1. In your own words, pray about today’s word as led now. 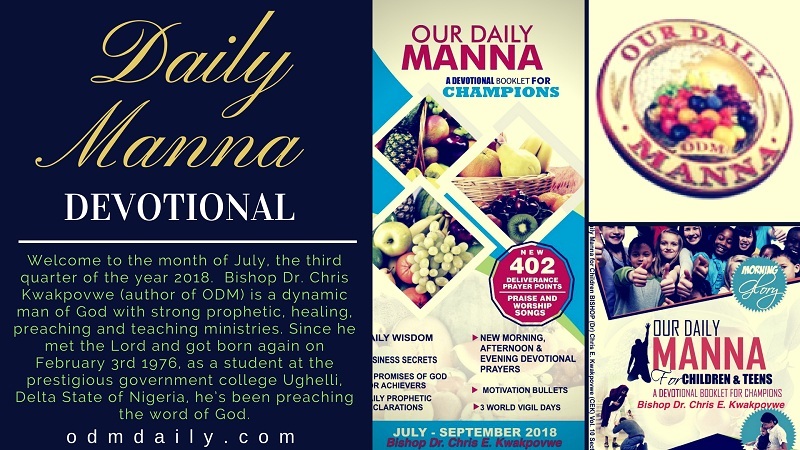 Our Daily Manna 11 October 2018 – TOPIC: LET THEM SAY! 2. Repent from worrying about what others say or think about you. 3. Lord, I refuse to have men as my IDOLS! I care about what you think about me! Previous Post:ODM Daily Reading 10 October 2018 – THE TOP MAKES YOU A TOPIC! HOLD ON! Amen and amen indeed this is true we should mind our own business in life. Man will let me down but God wont let me down no matter the situation iam going through in life.